SIGNING WITH POGI! Good News to all RJ Ledesma's fans! Pogi will have a book Signing on September 14, 2012. 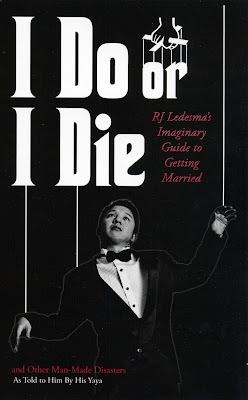 Yes, I admit I am a fan of RJ Ledesma! He is so talented! Plus he exudes this charisma that radiates as if telling everyone around him to be happy. He always makes it a point to smile and make other people smile as well. Aside from hosting television shows, weddings ( I personally saw him in action at my cousin's wedding, I tell you, RJ is a fantastic host! ) and events, organizing the Mercato Centrale group of food markets, editing a men’s magazine and writing a weekly newspaper column, (and yes, he was ‘Joey’ in the Royal Tru-Orange that came out in the eighties), RJ is also the author behind four best-selling humor books Lies My Yaya Should Have Told Me (2008), I Do Or I Die (2009), Is It Hot In Here Or Is It Me? (2010) and It Only Hurts When I Pee (2011) from Anvil Publishing. His third book, Is It Hot In Here Or Is It Me, was a National Book Award Finalist in the 30th National Book Awards. His books are a collection of his “Pogi from a Parallel Universe” columns in the Philippine Star. Join RJ Ledesma as he signs all four of his books on Friday (September 14) from 5:00pm-6:00pm at the National Book Store booth of the 33rd Manila International Book Fair in SMX Convention Center, Mall of Asia Complex, Pasay City. For more information, please visit www.facebook.com/AnvilPublishing.